Based on reviews from 2,650 experts and 391,864 users. Learn how our rankings work or see our guide to grey running shoes. Updated Apr 2019. Why do we love the color grey? According to psychology, plenty of people look at grey as practical. It doesn’t aim to stand out because it’s more muted compared to other colors. However, it acts as a stabilizer. When it is mixed with more vibrant colors, grey dilutes them making them look more subtle. With softer colors, it acts as an enhancer. What’s more interesting is that there is no perfect grey. Some greys can have tints of red, blue, and even green. This fact could explain why the color is so appealing and versatile to most since it can have a little bit of everyone’s favorite color. Personality-wise, grey lovers are neutral with life. They neither want excitement or dullness. They’re somewhere in between, always wanting to be safe, secure, and balanced. The great thing, though, about grey lovers is you can, absolutely, rely on them. Those that gravitate towards grey are more likely to be hard-workers – they get the job done because they’re that committed to whatever they set their mind to. Because of the color’s neutralizing effect, runners usually choose grey shoes for running because they can go with anything. Whatever color outfit you have on, a grey running shoe will almost always look good with it. One advantage of this is that runners will be able to use the same shoe for different activities - running, training, going to the gym, or even going to work. Commonly, running shoes aren’t just made up of one shade of grey. Sometimes you’ll see a lighter grey mixed with a darker one, plus an accent color to make the design more cohesive and stand out. Typically, you will see either white or black as the accent color, like on the Adidas Ultraboost Uncaged. Other times, you will observe a more vibrant color like blue, added into the mix, like the Brooks Adrenaline GTS 18. Whatever grey shoe for running you choose, make sure that it is suites your needs for both function and versatility. Think about what you’re going to use your shoes for, and think about the kind of activities you’re going to do in them. There are plenty to choose from in the market for trail and road running. Both the men’s and women’s versions of the Nike Air Zoom Winflo 4 have good choices for colorways. Most of these color options have grey as an accent or as the main color of the upper. This shoe was well-received because of its affordable price and durability. Runners were able to experience a responsive ride with this shoe on. 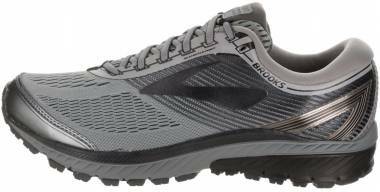 Plenty of runners’ love for the Brooks Launch series was awakened because of this 5th version. Many found it to provide a comfortable underfoot experience. Its construction was also note-worthy to some. Although there were those who complained about the width and the arch, the negative reviews did not diminish the positive ones. Users raved about the Brooks Ghost 10’s performance when it came to light training, tempo runs, long runs, and everyday use. Many appreciated the comfort it brought. Possessing minor yet significant updates from its predecessor, the Ghost 10 is a neutral running road shoe that has been upgraded with a smoother and more responsive ride. A majority of reviewers praised the Nike Flex RN 2017 for its simplistic yet cool look. Sneaker enthusiasts were especially happy about this because they can use the shoe for casual wear. On top of that, plenty of users also raved about its comfortable construction. There were a few who questioned its durability and fit, but these reviews did not take away from the majority of reviews commenting about the shoe’s versatility. A lot was expected from the Brooks Adrenaline GTS 18 because of the reputation of its predecessor. Plenty of runners were impressed by its ride and performance on the road, but there were those who were not so pleased with its design elements and durability. Nevertheless, the shoe is still a solid motion-control option that works well for its function. Most were happy about the Salomon Kalalau’s lightness and breathability, despite it coming in with plenty of technologies for light trail running. Generally, users received this neutral trail runner well and gave it praises for its design, comfort, and functionality. Most runners were satisfied with the comfort and versatility the Adidas Pure Boost All Terrain delivered. There were a few who thought that some of its design elements needed to be improved to bring better efficiency. However, these negative reviews did not affect the overall popularity of this neutral grey trail running shoe. Salomon’s Speedcross 4 CS was found to be a reliable trail runner designed to cater to natural foot movement. The water-repellent upper worked pretty well, keeping runners’ feet dry even during wet conditions. Based on most reviews, it offered great cushioning, breathability and protection. Plenty of users were glad that the Merrell All Out Crush was lightweight for a trail shoe. It delivered enough comfort and protection underfoot, but only on a light trail. Its features may not be suitable for more technical terrain. However, the shoe still turned out to give plenty of traction and grip. For more information about the grey shoes for road and trail running, click on the names of the shoe on the lists to view their full reviews. 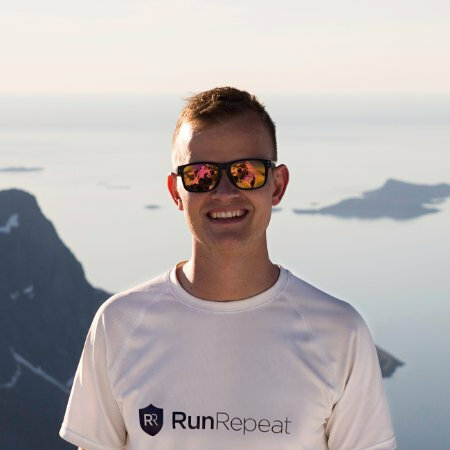 You can also visit RunRepeat, to check out the CoreScores for the shoes you like. Any black or white outfit will look great with grey because they are in the same color spectrum. This color combination allows you to look chic, minimalist and clean. Whether you are sporting your grey running shoes and black or white outfit at the gym, on the road, or on the trail, your ensemble will give off the impression that you’re serious and focused on your workout. Generally, runners can also pair their grey running shoe with pastel colors. This outfit leans more towards being feminine so female runners can definitely turn heads with this color combination. For example, an amethyst colored top will look cohesive with a light grey bottom, complemented with a grey running shoe. Other pastel colors to consider are aquamarine, apricot, coral pink and similar. This color combination works best for those who want to give off a masculine vibe but still look chic or sophisticated. As a general rule, you can pair dark grey with any dark color or vibrant color. If you have a dark grey top or bottom, you’ll look great if you wear colors like English green, indigo dye, medium blue or the like. Lastly, if you pair different tones of grey, your outfit will also look stylish and put-together. Remember that there are greys with different undertones. For example, slate grey has a blue undertone to it. So you can mix it up, experimenting with matching one grey tone to another. Don’t be afraid to experiment with different color combinations for grey. As mentioned, it is a versatile color so you can practically get away with whatever color pairing you want. Also, grey is a muted color so those of you who don’t want to stick out from the crowd can go as crazy with your combinations as you want. What’s the difference between a road and trail running shoe? Basically, running shoes for the road and trail have different features. Road running shoes are protective but not as protective as trail running shoes. Road shoes were designed to go over concrete or asphalt, so the concentration is not on protection, but on other factors like comfort and responsiveness. A trail shoe, on the other hand, concentrates on protection, comfort, and grip security. What factors do I need to think about when choosing a running shoe? There are several. You need to think about your needs, first of all. Do you need a shoe for training? 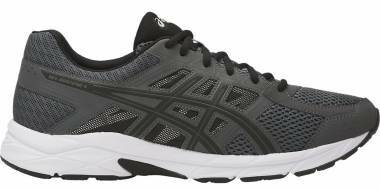 Do you need a grey running shoe for the gym? Or do you need one for the trail? Once you’ve figured out the specific purpose your shoe will serve, you can go from there and determine the features you need. Everyday Usage - If you want a grey running shoe to use as a sneaker, your main focus could be on style and comfort. Look for a grey running shoe with a cool-looking upper. The midsole needs to deliver exceptional comfort underfoot, so you feel great the entire day you’re walking or standing. Road Running Usage - Today’s road running shoes come equipped with plenty of features for comfort, style, and responsiveness. Depending on what your preference, you might want to have a trainer with a breathable upper, enough traction on the road, sufficient room in the toe box, and a responsive or cushioned midsole. Trail Running Usage - Trail shoes need to be robust. Because they’re going to take a beating every time you use them on the trail, they need to be sturdy and durable. Some runners prefer their trail shoes to be waterproof, but not all shoes for trail running have this feature. The rest of the features need to focus on traction and foot security. This could mean that the outsole is reliable with aggressive lugs, and with upper features that will minimally lock the midfoot and heel in place. What is pronation and should I be considering it? Pronation is the natural rolling of the foot inward when running. Some pronation is good but when it is excessive, therein lies the problem. Overpronation can cause a lot of injuries which is why you need to consider it when you buy grey running shoes. There are specific shoes for overpronation and underpronation. The best way for you to know how you run would be to go to a store that specializes in running apparel. Have them analyze your gait. This will be the most accurate way to tell if you’re an overpronator or not. How long will my grey running shoe last? The number of miles your shoes can stand will depend on the durability of its outsole. If you run in your shoes every day, you’d expect them to wear out quickly when they are only equipped with an average midsole and outsole. However, if you only use the same shoe for everyday activities, their shelf life might be extended. Do you have any tips for the best fitting grey running shoe? The most important tip for fitting would be that your usual size preference may not work all the time. You need to wear the shoe to get the best fit. Ideally, your grey shoes for running need to have enough wiggle room in the toe box and a snug midfoot and heel section on the upper. The wiggle room is for your toes to splay freely. The correct-fitting midfoot and heel section ensures that the foot remains stabilized within the shoe. What is arch support and do I need shoes that have it? Your arch is the curve underneath your foot. There are three types: flat, normal, and high. How high our arches are situated dictate the amount of pronation we do while we run. So, yes, arch support is an important factor to look into when buying a grey running shoe. When you have high arches, you’re typically going to need a shoe for overpronation which is called motion control. For those with normal to low arches, a regularly-arched shoe will work fine. If you’d like to know more about arches, read this RunRepeat Arch Support Study. I have bad knees and other foot problems. 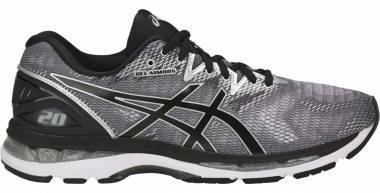 What grey running shoe should I be looking for? So that your foot problems are not aggravated you need to choose grey shoes for running that have the right features. If you have joint pain, you’ll be able to benefit from running shoes with a good amount of cushioning. Other foot problems can be solved with the right running shoe insole. It would be ideal to have your foot problems taken care of by a doctor. During your consultation, you can ask your physician the types of running shoe features that will work for your specific foot condition. Can I use my grey trail running shoes indoors? You can, but some trail running shoes have a different outsole material than regular road shoes. Some outsole rubbers may leave marks on wooden floors. Some, however, do have non-marking rubber outsoles so if this is the case, then go ahead and step indoors with your grey trail running shoe on.